Specialized gunbarrel oil water separators are best suited for applications that have oil volume in excess of water volume in the produced fluids. Our gunbarels are manufactured using a high quality isophthalic resin. All our gunbarrel separators are chemically resistant to all types of crude oil and salt water. Tank capacities available range from 100 – 1,000 bbl. They come complete with premium quality fittings, couplings, flanges, gaskets, manways and hatches. 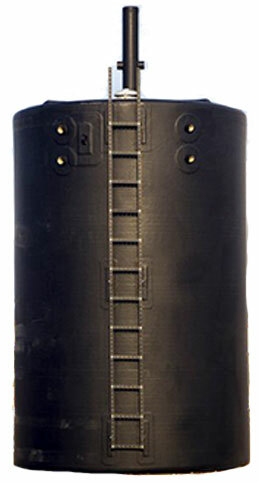 Gel coats to protect the tank from ultraviolet (UV) rays is also available.